Greensboro’s earliest buildings rarely soared to dizzying heights due to low market demand and frugal financial capital. Traditional building materials such as wood and brick generally limited construction height to three stories, except for an occasional courthouse cupola or church spire. Early images of Greensboro’s skyline show structures peeking around treetops, with rare architectural features and water towers punctuating the vista. The designer of the building is now known, but the structure was Neoclassical in style, featuring rounded upper-story windows, a glass storefront at street-level, and an open gallery on the fifth floor with a heavy entablature. The office block was leased by Southern Loan and Trust Company early enough in the construction process that the company’s initials SL&TCo were emblazoned atop the entablature. Within a few years of completion, the fourth and fifth floors were finished as apartments, with a restaurant on the fourth floor. Demand for office space required complete reversion of these spaces to office use by 1910. Southern Loan and Trust Company evolved into Pilot Life Insurance relocated to Sedgefield in 1928. The structure was destroyed in 1938 and the lot remains vacant in 2018. 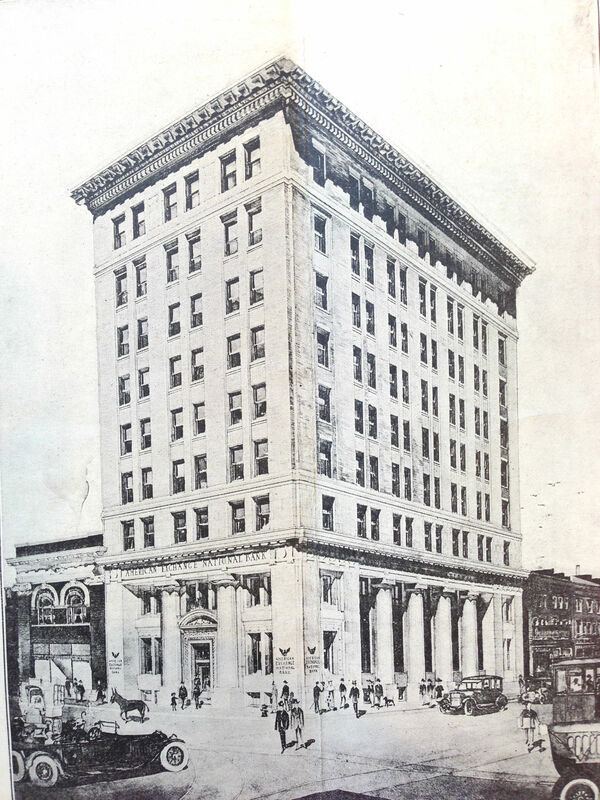 The architectural scale of this early office building must have stoked a competitive spirit among Greensboro bankers, for in July 1900, the Greensboro Loan and Trust Company announced its intention to build a handsome banking house at 319 South Elm Street. 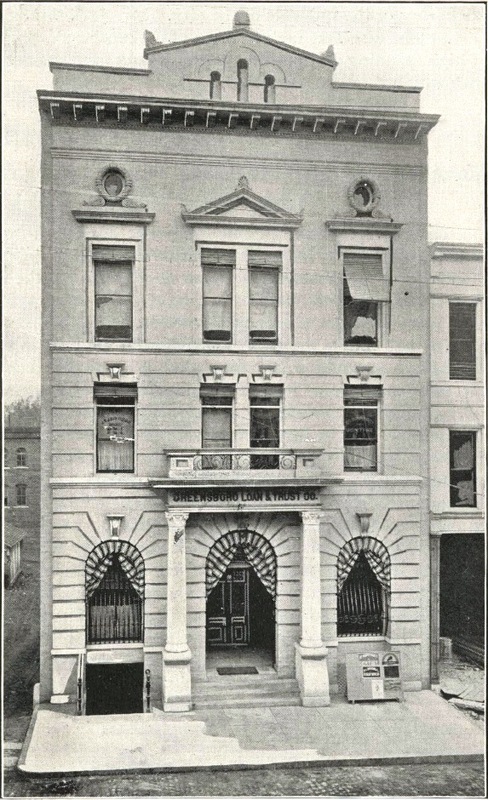 Although this new banking house did not exceed the Southern Loan in height, the building introduced higher expectations in terms of quality of materials and architectural detail of Greensboro’s architecture. 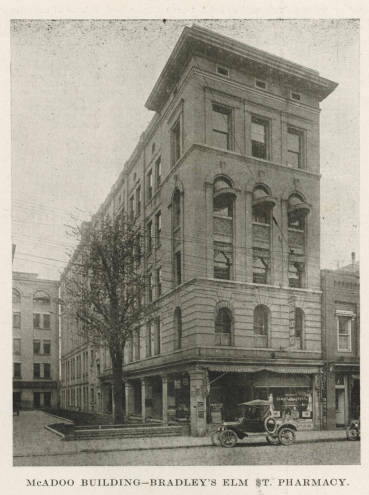 The offices of Greensboro Loan and Trust were among the earliest high-styled commercial facades in the city, evoking Renaissance period designs of Italy with its classical ornament, broken pediments, wreathed windows, and heavy modillion cornice. Just a few years later, in 1904, two more Greensboro developers saw a future in skyscraper construction. Calvin N. McAdoo purchased a narrow lot adjacent to the Federal Building at 113 South Elm Street, and hired architect Frank Weston to erect a five-story office block. Weston designed the McAdoo Building just 26 and a half feet wide, as the narrowest of the early skyscrapers. The $30,000 building was ornamented on the façade and the north face overlooking the Federal Building. It featuring gray pressed brick and granite Neoclassical details and a deeply scored joint technique on the second floor. Contractor W. R. Pleasants & Co. delivered the completed building within six months. The building’s prominent location and distinguished appearance made a popular address. 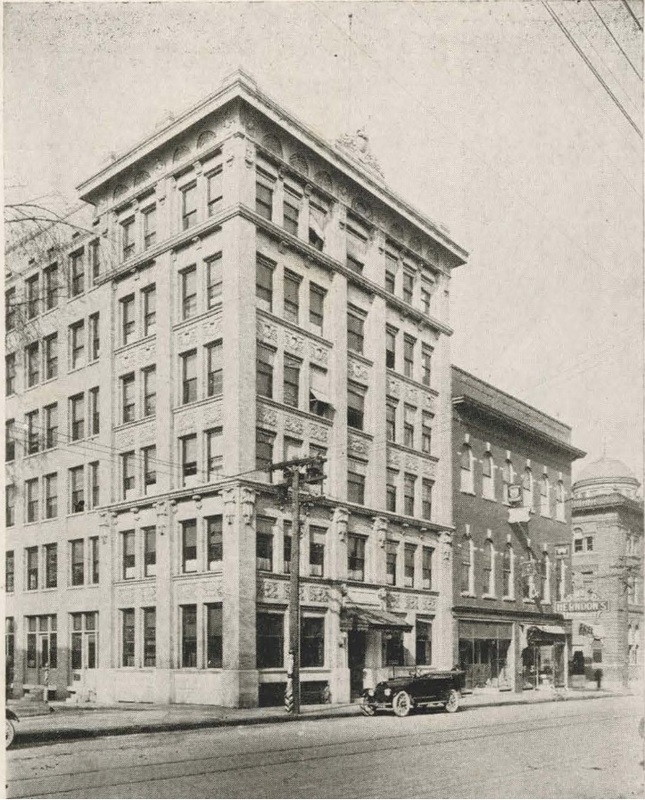 The Greensboro Life Insurance Company moved into offices on the first floor. Physicians and a cotton broker occupied upper floors. The Greensboro Lodge No. 602 of the Benevolent and Protective Order of Elks took space on the fifth floor with views across the city. The narrow floor plan of the McAdoo might have been its downfall. The upper three floors were removed in the 1930s, however the deeply scored joint details remain a part of the façade today. It is part of the Downtown Greensboro Historic District. As the McAdoo Building was being built, the City National Bank announced simultaneous plans for their new five-story City National Bank Building at 125 South Elm Street. Architects Frank A. Weston and James Henry Hopkins used popular Renaissance Revival details to embellish the office tower. Rusticated Mt. Airy Granite and arched openings of the ground floor are topped by polygonal bay windows, arched windows, terra cotta ornament, and a massive dentil cornice. Contractor W. C. Bain completed the building in July 1905. It is the tallest in the city completed in its decade. The bank occupied most of the first floor, while the Merchants’ and Manufacturers’ Club leased the second floor. 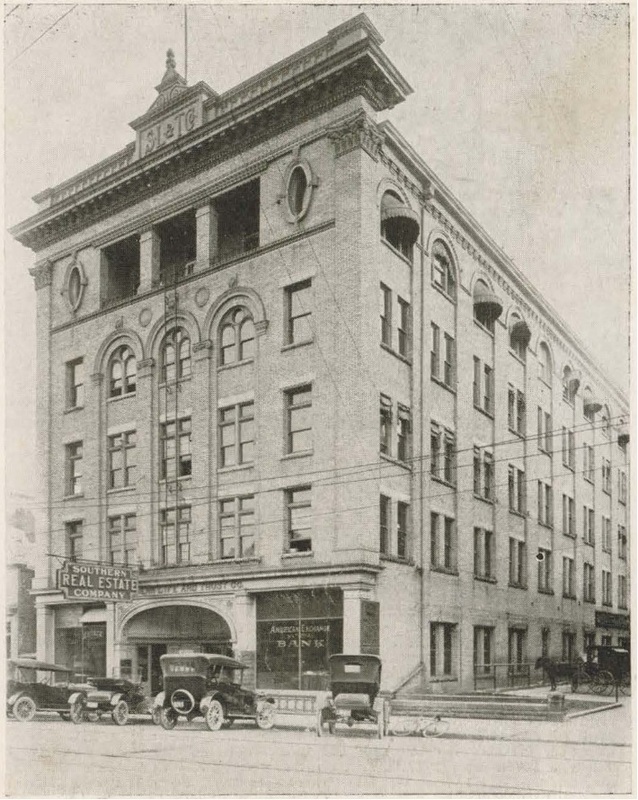 Shortly after completion, the Dixie Fire Insurance Company moved into the structure and took over naming rights to what became known as the Dixie Building. By 1907, Greensboro had several structures that rose to five stories in height, but none surpassed that benchmark. Greensboro’s attention was diverted to neighboring High Point in June of that year, where the Armfield banking family announced plans for a seven-story skyscraper there. In the race to the sky, Greensboro was losing to other cities such as Charlotte and Winston-Salem where the fourteen-story Independence Building and the seven-story Wachovia Bank towered over their skylines respectively. The Banner Building quickly filled with professional offices, including physicians, associations, insurance companies, a building and loan, and lots of attorneys who found the location adjacent to the courthouse square convenient. The Neoclassical-style building joined others in the city with references to the Rome applied to a modern vertical form. The Banner Building was destroyed in 1974 to make way for a new NCNB bank building. 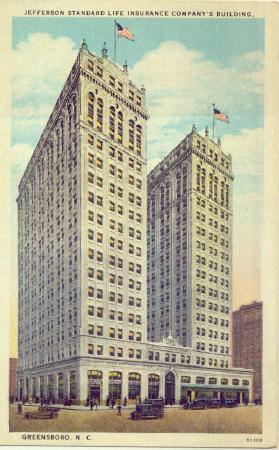 In 1912, the Banner Building eclipsed the Dixie Building by one floor. Not to be out-done, the Dixie Fire Insurance Company announced plans for the addition of a new floor to match the Banner Building’s height. The Greensboro Daily News reported in 1913 “In a short time the work of construction on the rear of the Dixie Building of an addition will begin, the contract for the construction having been signed by the Dixie Fire Insurance company with Longest and Tessier yesterday morning. The addition will be made by Harry Barton, an architect of Greensboro. The structure will be modern throughout, and will conform to the general appearance of the present building, which is one of the most attractive and imposing business buildings in the city. The addition will have a frontage of 34 feet on Sycamore street, and will be six stories high to conform to the present building. The Merchants’ and Manufacturers’ club through this addition will acquire new and handsome quarters. 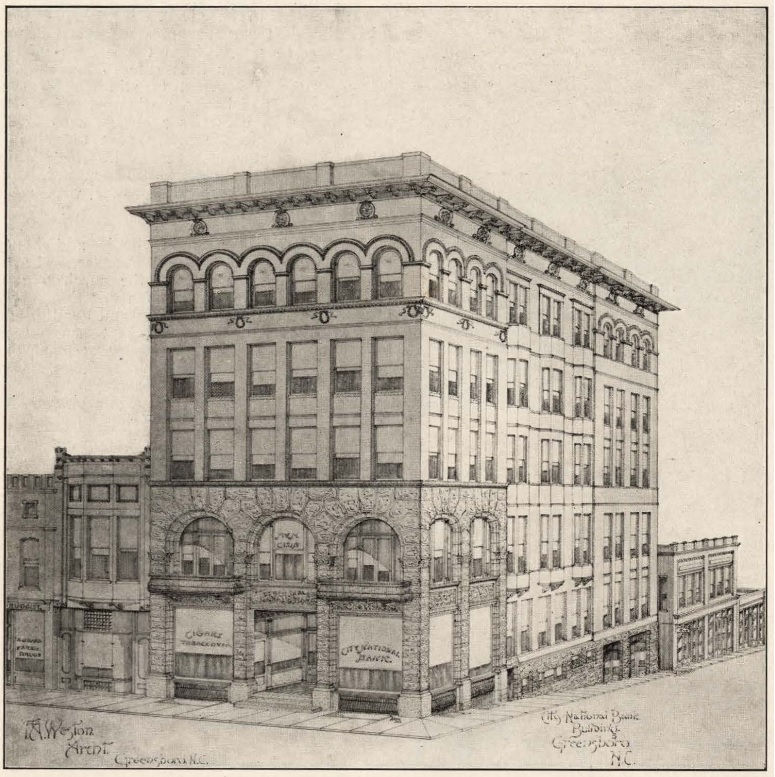 On the ground floor there will be two store rooms, and the other rooms will be used for office purposes.” The Dixie Building remains standing today as part of the Downtown Greensboro Historic District. It is also a locally designated Guilford County Landmark property. The American Exchange Bank Building was occupied by 1920 with a variety of smaller companies, and was later sold to the Southeastern Realty Company, giving the structure its most recent name – the Southeastern Building. It remain as office use into the twenty-first century and was included in the National Register nomination for downtown Greensboro. In 2015-16 is was reopened as apartments. The restoration project received awards from both Preservation Greensboro and Preservation North Carolina. The Jefferson Standard Building was built on a scale not seen in North Carolina. At 17 stories in height it was the tallest in the state and allegedly tallest between Baltimore and Atlanta. It was (and still is) North Carolina’s premier Beaux Arts skyscraper. Not only were the dimensions shattering, but the tower was innovative – sheathed with terra cotta tiles – a light weight material that was cheaper and faster to install. The project cost an extraordinary $2,500,000 to build and Jefferson Standard’s president was not shy in expressing superlatives. Julian Price shrewdly estimated the stature of the new building made a statement about the sound financial foundation on which the company was built. The company immediately took the top five floors of the building for their own use, and rented other floors to a variety of companies including Armour Fertilizer Company, the Atlantic Bank and Trust, architect Charles Hartmann, an army of doctors, lawyers, and financiers. Through the years, the company’s footprint inside the building increased until it was exclusively owner-occupied. The Jefferson Standard Building remained the tallest in the city until the company merged with Pilot Life and erected a new tower adjacent to it in 1989. The building was added to the National Register of Historic Places in 1975. Its most recent restoration was received an award from Preservation Greensboro. It is now part of the Lincoln Financial building campus.